In recent years, intrathecal baclofen (ITB) has attained an important role in the treatment of severe spasticity and dystonia in children. There are principal differences between the use of ITB in children and its use in neurology and oncology in adults. Here, we present a consensus report on best practice for the treatment of severe spastic and dystonic movement disorders with ITB. 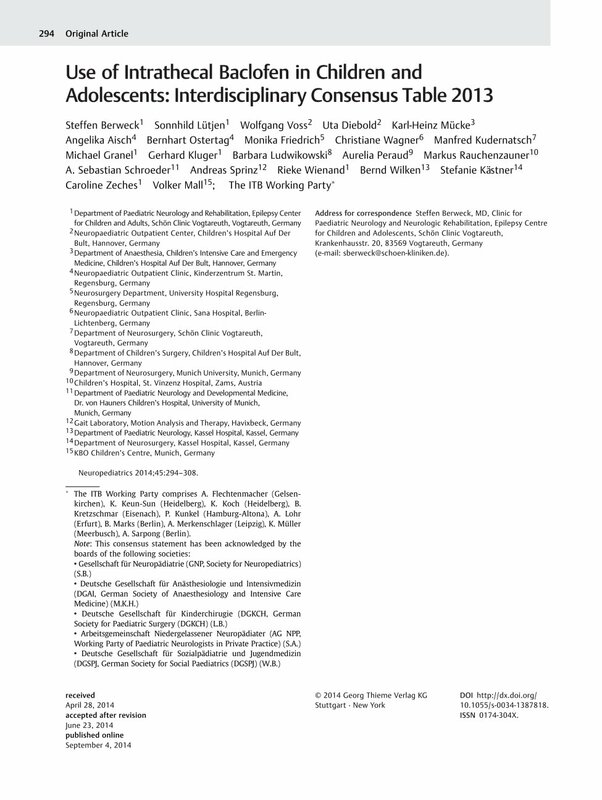 Using a problem-orientated approach to integrate theories and methods, the consensus was developed by an interdisciplinary group of experienced ITB users and experts in the field of movement disorders involving 14 German centers. On the basis of the data pooled from more than 400 patients, the authors have summarized their experience and supporting evidence in tabular form to provide a concise, but still a comprehensive information base that represents our current understanding regarding ITB treatment options in children and adolescents. * The ITB Working Party comprises A. Flechtenmacher (Gelsenkirchen), K. Keun-Sun (Heidelberg), K. Koch (Heidelberg), B. Kretzschmar (Eisenach), P. Kunkel (Hamburg-Altona), A. Lohr (Erfurt), B. Marks (Berlin), A. Merkenschlager (Leipzig), K. Müller (Meerbusch), A. Sarpong (Berlin).